Just in time for the beginning of cyclocross season, VeloPress has published the third edition of Simon Burney's book, Cyclocross Training and Technique. The book is available now at VeloGear.com and in North American bookstores and bike shops. Cyclocross Training and Technique, 3rd Ed. fully updates and expands the book to explore every aspect of this increasingly popular sport. Beginners and veterans alike will benefit from comprehensive explanations of cyclocross racing techniques and tactics. Riders will improve basic skills of climbing, descending, and bunny-hopping over obstacles with step-by-step descriptions and photographs of the pro riders at work. Burney covers how and when to dismount and remount a bike, as well as how to tackle tough course conditions from snow to sand to mud. With the latest on equipment and bike fit, newcomers will be off to a good start with the proper gear. A newly expanded training section describes how to train on a monthly, weekly, and daily basis, with hints for on- and off-road training as well as run training and training indoors. Burney's expertise is complemented with tips from some of the best racers in cyclocross. Simon Burney has spent the last 20 years managing cyclocross and mountain bike teams, and has worked with some of the top cyclocross riders in the world. Since 2000, Simon has worked for British Cycling as the Performance Mountain Bike Team Manager, and he continues to manage the national team at the 'cross world championships. 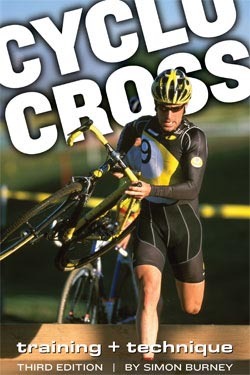 VeloPress is offering limited quantities of Cyclocross to 'cross race producers to use as prizes. Contact Dave Trendler for more information. VeloPress books are also distributed by AlpenBooks, American Bike Trails, American Cycling, Hawley, J&B, and QBP. VeloPress is an endurance sports publisher focusing on the sports of cycling and triathlon, with training books that help both serious athletes and beginners build skills and fitness. VeloPress authors are trusted experts in training, gear, maintenance, nutrition, and the history of our sports. VeloPress is the book publishing division of Inside Communications, Inc., publisher of VeloNews and Inside Triathlon magazines.